It is an apt case of poetic justice that Jackie Coogan- once called 'The Most Famous Boy In The World'- should be profiled by his main silent screen rival, Diana Serra Cary- known to the world as ‘Baby Peggy’. The links between the two actors are not confined to their professional cinematic rivalry, however. Both were ‘victims’ of their prolific early fame (Coogan reduced to television appearances after his main-grade film career petered out in the late 1930s, Cary’s successful screen career ending while the movies were still muted) and also victims of parental control- Coogan’s case being the most highly publicised, and leading to the Child Actors Bill (also known as the Coogan Act) to protect other minors from financial exploitation. The links between Cary and Coogan go a significant distance in making Jackie Coogan- The World’s Boy King a success, for, as Cary herself states: ‘I witnessed Jackie’s early years at a very close range…it was easy for me to identify with him, as we faced many of the same daily challenges and demands’ (preface, p.xvi). Ultimately, it is this mixture of insight and empathy which makes Cary’s book so compelling- it does not merely tell the story of one of Hollywood’s most legendary child actors, it lives the story. It is hard not to make much of the comparison between Coogan and Cary (‘Baby Peggy’). The former (born in 1914) and the latter (born in 1918) were truly contemporaries, and both had an intriguing start to their film careers ably assisted by Fate. For Jackie Coogan, it was his parents’ Vaudevillian exploits that ultimately drew the attention of Charlie Chaplin to the youngster- Coogan’s appearance in A Day’s Pleasure (1919), though, being little more than a screen-test for a future project. In a twist of irony, the boy’s father Jack was signed up by Roscoe ‘Fatty’ Arbuckle, and appeared in three 1919 shorts. Jackie Coogan, being left to Chaplin’s inventiveness, made The Kid (1921) and earned himself worldwide fame. Such beginnings are what film history is all about- twists of Fate, the pulling power of the early megastars and being steeped in romanticism, the sort of which only Hollywood could (or can) provide. Coogan’s rise to fame, though startlingly swift, sadly perpetuated the myth of the exploited childhood actor, although his fame was without measure- by the mid. 1920s he was the most famous juvenile in Hollywood and, thanks to extensive touring, a familiar name all over the world. Jackie Coogan Productions had been established in 1922 (when the boy was merely eight years old!) and everything was put on a business footing, meaning that Coogan’s parents, as employees of Coogan Productions, could claim a salary commensurate with their influential positions. Interestingly, fact and fiction- particularly where monetary matters are concerned- is increasingly blurred in this period, partly explained by the passing of time and the existence of reliable records but also by the propaganda put out by Mr. and Mrs. Coogan, who would seek to assure the world that their young son’s wealth was safely invested for his future. Whatever the exact figures, it is unquestionable that from the large sums Coogan earned as an actor in the early 1920s little of it would benefit him as he grew older, a situation eerily paralleled in that of ‘Baby Peggy’- whose fortune effectively evaporated following parental control of her finances. It is in this sort of instance where Cary’s book particularly excels- instead of a writer attempting to envisage what it must have been like, Cary can provide a first-hand account, the anecdote about her being 16 cents short for lunch and Coogan loaning her a ‘quarter’ is a chastening one that crystallises what the situation was like- these children were earning vast sums of money but virtually none of it was put to their benefit in any practical and tangible sense; their ‘allowance’ a miniscule fraction of the money their appearances were earning. The early to mid. 1930s were not cinematically eventful for Coogan, but his personal life became a film narrative in itself. After a strained relationship with his parents and falling school grades, Coogan’s friendship with Brooke Hart was to lead him into an extraordinary situation (later the grim inspiration for Fritz Lang’s classic 1936 film Fury) which he was, in retrospect, lucky to escape from unscathed. In 1935, personal tragedy again blighted Coogan’s life in an automobile accident that left four people (including Jack Coogan, Jackie’s father) dead but spared the then twenty year old Jackie Coogan’s life. The end of a turbulent decade in his life saw Jackie Coogan instituting a lawsuit against his mother and stepfather which accused them of withholding his past earnings, and also saw the end of a short-lived marriage to future wartime pin-up Betty Grable. In the 1940s and resulting decades, Coogan’s personal life continued to be tempestuous- he was married a further three times and had a total of four children across the marriages. His professional life too was in crisis- unable to regain popularity (especially after a stint in the Army which effectively put him out of the public eye), Coogan resorted to playing bit parts. Television offered an opportunity to re-gain his success, but apart from The Addams Family, he was relegated to guest appearances. Coogan died in 1984 at the age of 69, ironically in a stable marriage that had lasted for over 30 years. Despite his years of unhappiness and tragedy, Coogan was a survivor when not everyone was, and lived long enough to witness increased interest in his work- he was at least able to set the record straight on key aspects of his private life and, in doing so, saved the media speculation associated with many stars of the silent screen. If one considers the rightful acclaim given to Chaplin’s film The Kid (1921), it could be expected that a book about the movie’s co-star already existed. Not so. Diana Serra Cary has provided the first book dedicated to Jackie Coogan and for this fact alone she is to be warmly congratulated. Her book, however, merits more praise than this. The account of Coogan’s life is superbly well-written, and would appeal to the general reader as well as the film aficionado. Accompanied by a selection of lovely photographs, the text draws not only on Coogan’s experiences but also those of Cary herself which do not dominate but provide a canvas onto which she lovingly paints the details of Coogan’s life. Very readable and remarkably well-researched, Cary’s perceptive work has but one disadvantage- others will be disinclined to attempt a second volume on Coogan which is a pity, for the story of the ‘Kid’ who became the ‘King’ is a truly inspirational yet chastening one, relevant even in the high profile media-saturated society that we are living in today. 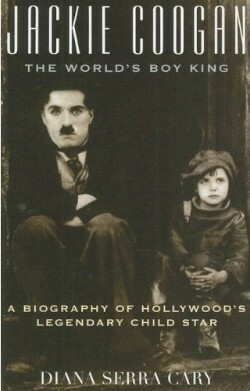 'Jackie Coogan- The World's Boy King' is published by the Scarecrow Press.